Ushahidi Mappers in Canada! Be still my prairie girl heart. Laura Madison and Dale Zak spent the winter preparing for the spring floods in Manitoba and Saskatchewan. 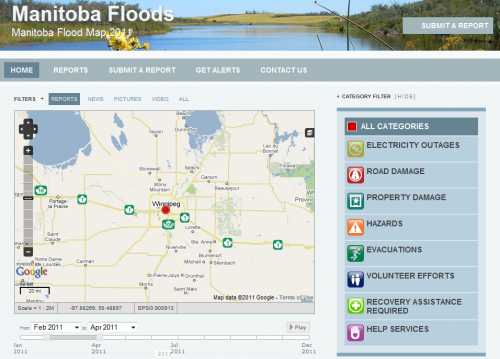 Extensive flooding is expected in both the Red River Valley and North/South Saskatchewan River regions. This is the first time that Ushahidi has been used to prepare and to report the floods in Canada. In fact, both maps are the first time that full scale Ushahidi maps have been prepared as part of the citizen reporting and digital volunteer response in Canada. There are Canadian university classes learning Ushahidi and CrisisCamp Toronto conducted an Ushahid beta test in February 2011. Laura is very active in the Ushahidi and Stand-by Task Force communities. Dale is active in the Ushahidi team. Each of us has mapped events around the world. And, we are delighted to see mapping come home. How to help Ushahidi is an open source project. There are three types of help required: Mappers, Developers, and Digital Volunteers. Maps are community-driven crowdsourcing. In the coming weeks, the needs will change daily or hourly. This is the beauty and curse of volunteer digital response. Both leaders have been in contact with official responders. However, at this time, their efforts are for citizen response and collaboration. MBFloods and SKFloods maps allow for reports to be filed by webform, Ushahidi app, iphone, android, or email. Maps allow for various layers of useful open data to be added. People will be able to add news reports, pictures and videos. Maps evolve depending on the community use. So the needs will change over time. The work they have done is fantastic. Bring on the crowd! People are needed to file reports, coordinate mapping teams for about 2 weeks. Laura and Dale will be coordinating this adventure via Skype. I am sure that the great mapping communities may lend a hand. 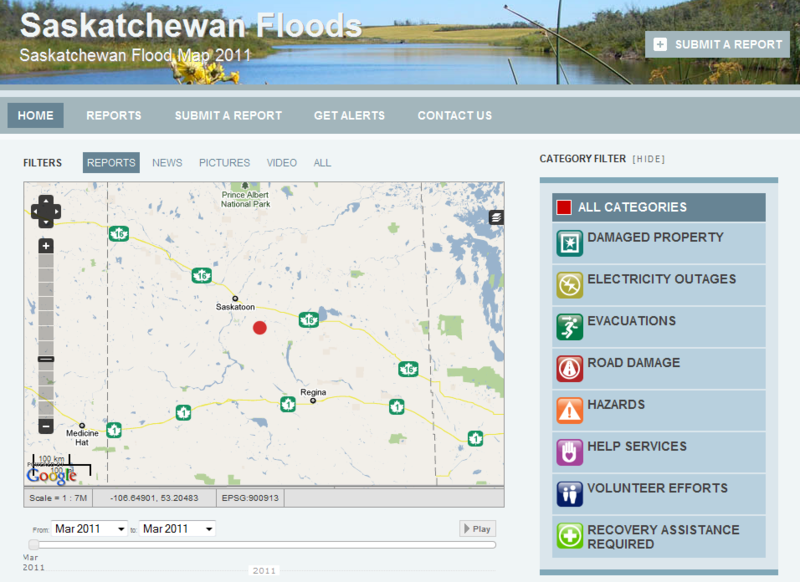 If you are an individual volunteer or are part of a volunteer technical community, please consider contacting: Contact Dale for Saskatchewan: skfloods AT gmail DOT com Contact Laura for Manitoba: flood DOT mbfloods DOT ca Participate in the joint Skype channel: Add Laura (organization9) to get started. Types of help required: Preparedness Laura has added layers for the Manitoba RCMP and Manitoba First Nations. She would like to add more layers. Mappers most welcome to churn out KML/KMZ files. She also needs some PHP help and Ushahidi expertise. Volunteer Recruitment and Training Both maps will need digital volunteer teams to support the mapping. The types of content you will be adding is geo-location, media monitoring (mainstream, twitter, facebook), and handling the various streams of online reports (webform, apps and email.) About Ushahidi To learn more about Ushahidi, see recently released Ushahidi Manual, created by the lovely crisismapper Anahi Ayala Iacucci. It outlines how to get started with Ushahidi and implement a successful deployment. Maps need a process, this Ushahidi Practical Considerations is also very helpful. Feel free to contact me as well (heather at textontechs dot com) if you want more information or want to be connected to Dale or Laura. Heather L.